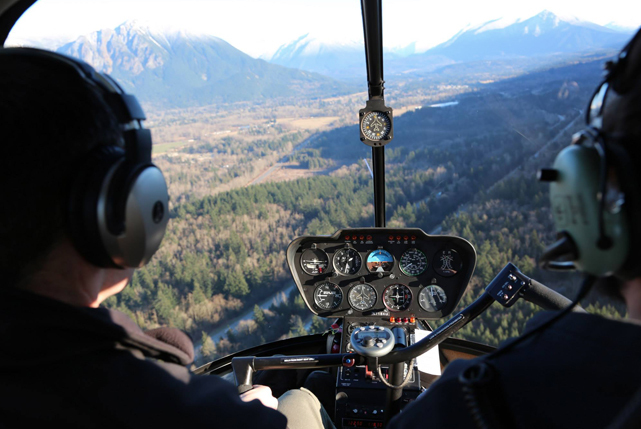 If you have ever dreamed of flying, and don’t know where to begin, Inland Helicopters can help. This is a great opportunity for a hands-on flight experience. We offer potential students a chance to experience a real flight lesson at a discounted rate. Our Discovery Flight gives the prospective student 30 minutes of ground and safety instruction, and 30 minutes of actual flight time. During the ground instruction, your flight instructor will explain the basics of the helicopter. During the flight your instructor will explain the controls, while demonstrating the helicopter’s capabilities and then give you an opportunity to handle each control. This Introductory Flight is perfect for students that want to explore the possibility of helicopter pilot lessons, without a substantial initial investment. Discovery flights are offered at $120 in R-22 and $220 in R-44.